HOW DO YOU CHOOSE A POOL SERVICE AND MAINTENANCE COMPANY? Inviting a service person into your backyard every week is a decision that should not be taken lightly. Here are a few tips to help you make that decision. Is the service company licensed by either the county or state, and do they have current liability and workers compensation insurance? What if they are injured while on your property? Insist that they show you copies of those documents. When you called did they offer to send someone out to inspect the pool first? Not all pools are the same. Some are basic and some have very modem, high-tech, electronic control systems that the technician must be familiar with. Is he/she? Some pools would be harder to clean and maintain than others. Does all the equipment function properly? 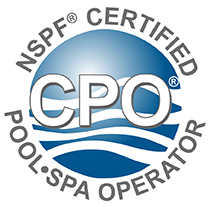 Has the service technician attended the Certified Pool Operators training course provided by the National Swimming Pool Foundation? This type of training is required to service and maintain commercial swimming pools and professional technicians would be anxious to attend. Take a look at the technicians' service vehicle. Is it clean and organized? Does it display the company's name and contractors license number? The way they maintain their vehicle is a direct reflection on how they will maintain your pool. Observe the technicians' appearance. Do they present a professional appearance? Are they uniformed. Are they clean and neat? Do they really look like the type people you would trust in your yard each week? Trust your instincts. Make sure they provide all the services required to properly maintain a pool. Do they test your chemicals with an approved test kit? Do they scrub your tile with a proper tile brush and tile soap? Do they vacuum the floors? Do they brush the walls with a wall brush? Do they skim floating debris from the pool surface? Do they empty the skimmer strainer basket and the pool pump strainer basket? And do they carry away the debris? Do they keep your main filter dean when the pressure gauge indicates it needs cleaning? And do they use quality chemicals to maintain a safe water chemistry balance?